Took this photo on a recent trip to Labrador. Canon 10D with a 28-135 (on 28mm). Fantastic shot!! Keep them coming!! Fantastic! You gotta da great photographic touch, joe brazil! Reminds of the trip I took to the Rock several years ago. Thanks for the memories. You really caught the majesty of the place. Its always a treat to see a falls shot with a rainbow included. I like the aerial perspective...and the splashes of greenery nicely contrast against the otherwise brown/gray cliff rock. Thanks for the comments. The photo was taken at 7am as that is when the light hits the falls in the narrow gorge. The photo was taken from my campsite. I was standing on a ledge. There is a 3rd waterfall but the angle of the lenses was not wide enough to get all 3.
very very nice. 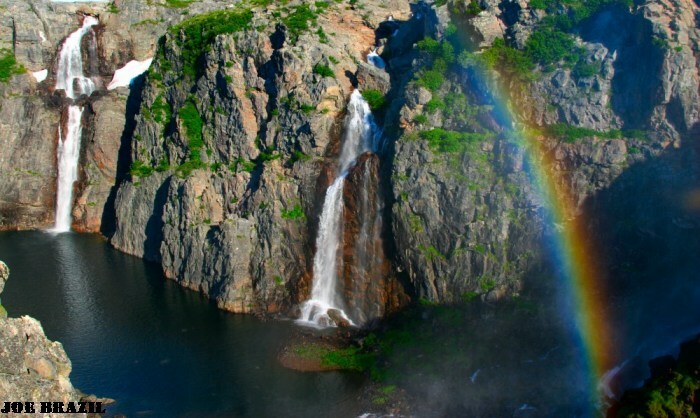 Waterfalls and rainbow, that goes together. Lovely shot joenl. Cheers from the flakey west coast........thekman.